This study shows that naive CD8 T cells can acquire characteristics of memory T cells in the absence of stimulation with specific Ag simply by the process of homeostatic proliferation under lymphopenic conditions. This Ag-independent T cell differentiation pathway did not result in up-regulation of early activation markers (CD69, CD25, CD71), but expression of several memory markers (CD44, CD122, Ly6C) increased progressively with successive divisions. These markers were then stably expressed, and these cells also became more responsive functionally to specific Ag. Thus, all “memory” phenotype T cells in an individual may not be true Ag-experienced cells and may include naive cells masquerading as memory cells. These findings are specially relevant in cases of disease or treatment-induced lymphopenia such as in HIV-infected individuals or transplant recipients. In addition, this study may have implications for autoimmunity because homeostatic proliferation of naive T cells requires interaction with self peptide plus MHC molecules. Naive T cells proliferate rapidly on exposure to specific Ag and differentiate into effector cells; then a fraction of these activated cells survive and persist long term as memory T cells (1, 2, 3). This Ag-driven proliferation and differentiation process is associated with altered expression of several cell surface markers, many of which persist indefinitely on memory T cells (4, 5). It is these altered surface markers and the ability of memory T cells to make rapid responses on reexposure to Ag that form the basis of distinguishing between naive and Ag-experienced memory T cells (6, 7, 8). It is now well established that naive T cells can also proliferate under lymphopenic conditions (3, 9, 10, 11, 12, 13, 14, 15). This homeostatic proliferation of naive T cells is not dependent on cognate antigenic stimulus but requires interaction with self peptides plus MHC molecules (3, 9, 10, 11, 12, 13, 14). The functional and phenotypic changes that naive T cells undergo during emptiness-induced homeostatic proliferation are not well characterized, and it is not known how these differ from changes induced by Ag-driven proliferation. In this study, we addressed this question by comparing the phenotypic and functional changes that occur in naive CD8 T cells in vivo during homeostatic vs Ag-driven proliferation as a function of the number of cell divisions. P-14 TCR transgenic mice (16) that express a CD8 T cell-transgenic TCR specific to peptide GP 33–41 of lymphocytic choriomenigitis virus (LCMV)2 were obtained from The Jackson Laboratory (Bar Harbor, ME) and backcrossed to C57BL/6 background for 10 generations in our colony (3). In addition, P-14 mice that were backcrossed to RAG−/− mice were obtained from Taconic Farms (Germantown, NY) and used in several experiments. Identical results were obtained with P-14 transgenic mice on RAG−/− or RAG+/+ background. MHC class I-negative (Db−/− × Kb−/− × β2-microglobulin−/−) C57BL/6 mice have been described previously (3). CD44low CD8 T cells from naive P-14 TCR transgenic mice were FACS purified using a FACSvantage (Becton Dickinson, San Diego, CA). More than 93% of the purified naive CD8 T cells were expressing transgenic TCR specific to LCMV peptide GP 33–41. 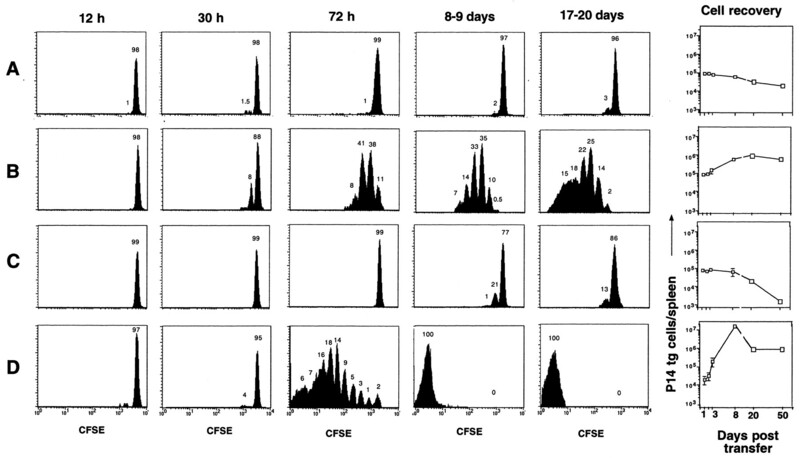 The cells were labeled with CFSE by incubation with 5 μM CFSE (Molecular Probes, Eugene, OR) for 7 min at room temperature in PBS followed by quenching the unlabeled CFSE by adding excess amounts of FCS and washing. The recipient mice were injected i.v. with 0.4–1 × 106 CFSE-labeled naive transgenic CD8 T cells. Where necessary recipient mice were subjected to gamma-irradiation at 550 rad 6–10 h before cell transfer or infected with 2 × 105 PFU LCMV i.p. at the time of cell transfer (2, 3). Surface marker analysis and intracellular cytokine staining was performed as described (2, 3). To characterize Ag-driven and homeostatic proliferation, FACS-purified naive (CD44low) P-14 LCMV TCR transgenic CD8 T cells were labeled with CFSE and transferred into LCMV-infected mice (Ag-driven proliferation) or uninfected irradiated mice (homeostatic proliferation). As additional controls, these CFSE-labeled naive CD8 T cells were transferred into uninfected normal mice (i.e., uninfected and nonirradiated) and irradiated MHC class I-deficient mice (Db−/− × Kb−/− × β2-microglobulin−/−). Fig. 1⇓A shows that in normal mice there was minimal to no division of naive CD8 T cells and that their number slowly decayed with time. However, naive cells proliferated in irradiated recipients at a rate of one division per every ∼24 h, and nearly all transferred cells had divided by day 9 posttransfer, resulting in ∼10-fold increase in their numbers (Fig. 1⇓B). This homeostatic proliferation of naive cells was drastically affected if the irradiated recipient mice were lacking MHC class I expression, showing its dependency on self-MHC/peptides (Fig. 1⇓C and Refs. 3 and 9, 10, 11, 12, 13, 14). In striking contrast to homeostatic proliferation, Ag-driven proliferation progressed at a very rapid rate (one division per ∼6–8 h), resulting in >1000-fold increase in cell numbers within 8 days after transfer (Fig. 1⇓D). Note the remarkable difference in the total increase in cell numbers (1000-fold vs 10-fold) between Ag-driven vs emptiness-induced proliferation. However, the rapid Ag-driven proliferation was followed by a death phase (∼90% of expanded cells died between day 8 and day 20), whereas there was no apparent death phase following the slower homeostatic proliferation. Despite this death phase, Ag-driven proliferation resulted in a greater overall net increase (∼100-fold) compared with lymphopenia-induced proliferation (∼10-fold). In vivo proliferation of naive CD8 T cells by antigenic stimulus or by lymphopenic conditions (Ag-driven vs homeostatic proliferation). FACS-purified CFSE-labeled naive CD8 T cells from P-14 TCR transgenic mice were transferred into the following groups of C57BL/6 recipients: group A, uninfected nonirradiated; group B, uninfected irradiated; group C, MHC class I-negative mice that were uninfected but irradiated; and group D, normal mice that were LCMV infected. 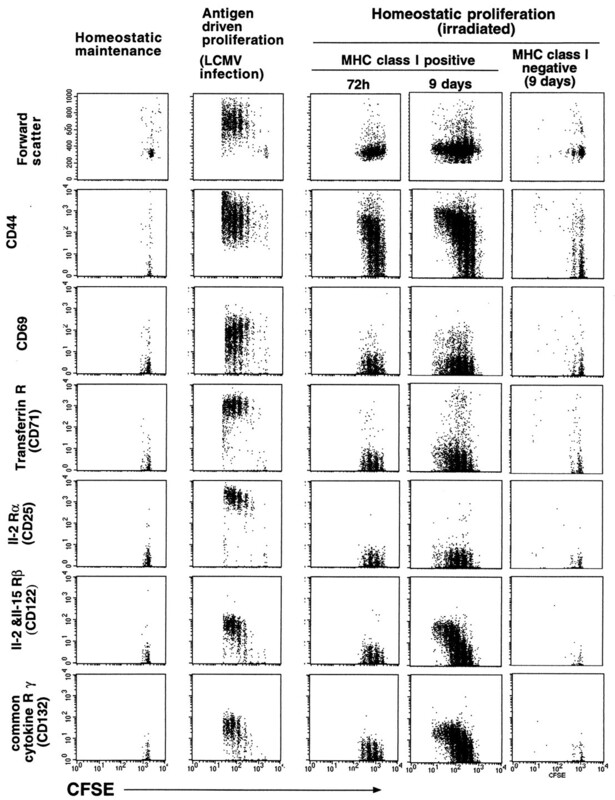 Data show proliferation (as examined by CFSE dilution pattern) of transgenic CD8 T cells recovered from recipient mice. Numbers indicate percentage of cells in each division. Right, Average number of transgenic CD8 T cells recovered from spleens of recipient mice (3–4 mice/group) at indicated time points posttransfer. We next examined changes in the expression of various activation markers during Ag-driven vs homeostatic proliferation of naive CD8 T cells as a function of the number of divisions (Fig. 2⇓). Without any stimulus, the transferred naive cells did not proliferate in normal unirradiated mice and did not up-regulate any cell surface marker examined. Following specific antigenic stimulus the naive CD8 T cells exhibited elevated expression of CD44, CD69, and transferrin receptor (CD71) from the very first division and maintained high expression of these markers in the subsequent several divisions that occurred within 72 h after infection. The IL-2 receptor α-chain (CD25) also remained high in all the divisions. The expression of the IL-2 and IL-15 receptor β-chain (CD122) and common cytokine receptor γ-chain (CD132) began to increase only from the third division. In marked contrast to Ag-driven proliferation, majority of the cells undergoing homeostatic proliferation in irradiated mice remained low for CD69, CD71, and CD25 expression. However, their CD44 expression gradually increased with successive divisions. Expression of CD122 and CD132 was increased on virtually all the cells with progressive increase in the number of divisions, and this pattern was similar to that seen in Ag-driven proliferation. The dependency of these changes on cell division was confirmed by the absence of up-regulation of these markers when naive cells showed minimal to no proliferation after transfer into irradiated MHC class I−/− mice. Expression of T cell activation markers as a function of cell division during Ag-driven vs homeostatic proliferation. FACS-purified CFSE-labeled naive (CD44low) P-14 transgenic CD8 T cells were transferred into C57BL/6 mice (homeostatic maintenance), C57BL/6 that were infected with LCMV (Ag-driven proliferation) or into irradiated MHC class I-positive or class I-negative C57BL/6 mice (homeostatic proliferation). CFSE-positive transgenic CD8 T cells from spleens of these mice were analyzed for expression levels of various markers at the indicated time points. In addition to the markers shown in the figure, changes in CD62L expression were also monitored. There was down-regulation of CD62L expression following antigen stimulation, but CD62L levels remained high on naive CD8 T cells undergoing homeostatic proliferation (data not shown). In summary, the data in Figs. 1⇑ and 2⇑ make the following points: 1) Ag-driven proliferation results in faster progression through cell cycle (∼6–8 h) compared with homeostatic proliferation (∼24 h); 2) expression of early T cell activation markers such as CD69, CD71, and CD25 is dependent on the nature of stimulus (i.e., only specific antigenic stimulus increased expression of these markers); 3) CD44 up-regulation reaches maximal levels within the first division after antigenic stimulus and remains high thereafter, whereas CD44 expression progressively increases with successive divisions during homeostatic proliferation; 4) expression of CD122 and CD132 is strictly dependent on the number of divisions undergone by the cells irrespective of whether the cells are undergoing homeostatic or Ag-driven proliferation. Increased levels of CD122 and CD132 were seen only after the first three divisions even during Ag-driven proliferation. CD122 has been implicated in the maintenance and turnover of memory T cells (8, 17, 18) through the action of IL-15, and our results suggest that a minimum of three divisions may be required to generate a memory T cell that can respond optimally to cytokines acting through CD122 and CD132. This information may be critical in designing vaccines that will generate long-lived T cell immunity. Vaccines that provide a weak stimulus during the activation phase of the T cell response are likely to generate “memory” T cells that express low levels of CD122 and CD132 and such T cells may have a limited life span. Thus, to generate a long-term memory, it may be critical for a vaccine to initially provide a sufficiently strong antigenic stimulus to induce the minimum number of divisions necessary to induce expression of these markers. We next examined the functional responsiveness of naive CD8 T cells that had undergone homeostatic proliferation. Fig. 3⇓A shows that very few, if any, naive transgenic CD8 T cells make IFN-γ when stimulated in vitro with specific peptide for a short duration (5 h). In contrast, the majority of transgenic cells that had undergone homeostatic proliferation for 8 days in irradiated recipients made IFN-γ after stimulation with specific peptide. However, the proportion of cells making IFN-γ and the relative levels of IFN-γ produced were lower than those of transgenic CD8 T cells that had received cognate antigenic stimulus in vivo (8 days after LCMV infection). We next examined the acquisition of cytokine responsiveness during homeostatic proliferation as a function of the number of divisions. Fig. 3⇓B shows that the increased production of IFN-γ by naive CD8 T cells that had undergone homeostatic proliferation was division dependent. Both the proportions of cells making IFN-γ and the relative levels of IFN-γ increased progressively with increasing number of divisions. Acquisition of increased functional responsiveness to specific Ag by homeostatic proliferation of naive CD8 T cells in irradiated recipients. A, Naive P-14 transgenic CD8 T cells were transferred into normal mice (dotted line, naive) or irradiated recipients (solid line, homeostatic day 8) or LCMV-infected recipients (LCMV day 8). After 8 days, spleen cells from the recipient mice were stimulated in vitro for 5 h with P-14 TCR-specific peptide (GP 33–41) followed by intracellular staining for IFN-γ production. IFN-γ staining of peptide-stimulated transgenic CD8 T cells are shown. Unstimulated samples did not make IFN-γ above background levels (see B). B, Acquisition of cytokine responsiveness during homeostatic proliferation as a function of the number of divisions. Right, IFN-γ production at each of the cell division after in vitro stimulation with specific peptide by naive transgenic CD8 T cells that have undergone homeostatic proliferation in irradiated recipients (for 8 days). Numbers indicate percentage of IFN-γ producing cells in each division. Left, Staining for IFN-γ in the unstimulated cultures. Memory CD8 T cells generated by stimulation with specific Ag are characterized by higher levels of surface markers such as CD44, CD122, Ly6C, etc., and exhibit rapid anamnestic responses upon reexposure to cognate Ag (1, 2, 3). It was crucial to determine whether naive CD8 T cells that had undergone homeostatic proliferation would also retain these “memory” characteristics or revert back to a naive phenotype. Fig. 4⇓ shows that even 150 days after transfer into irradiated recipients the transgenic CD8 T cells expressed higher levels of CD44, CD122, and Ly6C than naive cells and also produced more IFN-γ than naive CD8 T cells in response to specific Ag. Although these levels were considerably lower compared with true memory CD8 T cells generated by antigenic stimulus, it is significant that the increased responsiveness and “memory” markers acquired by naive T cells during homeostatic proliferation are maintained for at least 6 mo. Thus, our study shows that naive CD8 T cells can acquire phenotypic changes associated with memory T cells by two distinct mechanisms: the conventional pathway involving stimulation with specific Ag; and a new Ag-independent pathway involving noncognate interactions with self peptides/MHC under lymphopenic conditions. Maintenance of “memory” characteristics acquired by naive T cells during homeostatic proliferation. Naive P-14 CD8 T cells were transferred into either irradiated or LCMV infected mice; 150 days posttransfer the donor cells were stained ex vivo for expression of surface markers (CD44, Ly6C and CD122) or stained for IFN-γ production after 5 h in vitro peptide stimulus. Shaded histograms represent expression of indicated markers or IFN-γ production by naive CD8 T cells that were transferred into irradiated recipients 150 days ago. Solid lines represent staining pattern in true Ag-experienced memory cells. For comparison, staining of naive transgenic cells is shown as dotted lines. The background levels of IFN-γ staining in the absence of peptide stimulus were similar in all the samples. What is the biological significance of these findings? Naive T cells do not divide under normal physiological conditions (Fig. 1⇑ and Ref. 6). So it is unlikely that homeostatic proliferation of naive T cells in the periphery will be a significant factor in normal healthy individuals. However, there are several events, some natural, such as viral infections, and some treatment induced, such as irradiation/immunosuppressive drugs for transplant recipients and cancer patients, that can cause transient lymphopenia in humans (19). A particularly interesting situation is the reconstitution of T cell numbers that occurs in HIV-infected individuals after antiretroviral therapy (Ref. 20 and references therein). Any of these conditions could potentially provide a milieu for homeostatic proliferation of naive T cells. Thus, it is likely that in several instances all “memory” phenotype T cells in an individual may not be truly Ag-experienced cells and may include T cells that have never seen the cognate Ag but are masquerading as “memory” T cells. Studies on immunological memory have relied heavily, and in some cases exclusively, on markers to identify memory T cells. The assumption always has been that these markers define Ag-experienced T cells. Also, it is well established that there is an overall increase in the number of T cells with “memory” markers and also outgrowth of certain oligoclonal T cell populations during aging (21, 22, 23, 24). Once again, it is generally believed that this is due to Ag-driven expansion of T cells and represents the cumulative sum of the response to pathogens we encounter over a lifetime. Our study now offers an additional mechanism to explain the accumulation of “memory” T cells in aged individuals and suggests that homeostatic proliferation of T cells under lymphopenic conditions may play a role in this process. Finally, our study has implications for autoimmunity because homeostatic proliferation of naive T cells requires interaction with self peptides plus MHC molecules and may trigger autoreactivity. This is supported by several observations showing that both lymphopenia and aging are closely associated with higher incidence of autoimmunity (25, 26). Thus, the findings of this study not only provide a basis for better understanding of Ag-dependent and Ag-independent T cell proliferation and differentiation, but are also of relevance toward aging and autoimmunity. We thank Kaja Madhavi-Krishna for excellent technical assistance, Francois Lemonnier for the MHC class I heavy chain knockout mice, and Robert Karafa for the cell sorting. 2 Abbreviations used in this paper: LCMV, lymphocytic choriomeningitis virus; CFSE, carboxyl fluorescein succinimidyl ester; RAG, recombination activation gene; MFI, mean fluorescent intensity.